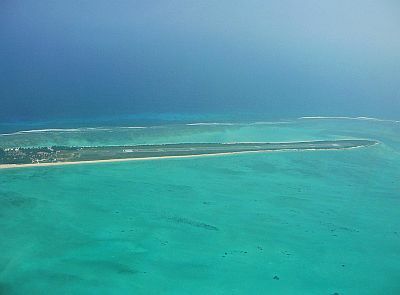 In the territory of Lakshadweep, located south-west of India, in the Laccadive Sea, the climate is tropical, hot all year round, with a dry season from December to April, and a rainy season from May to November. The territory is comprised of the Amindivi Islands in the north, the Laccadive Islands in the center, and the island of Minicoy in the south, near the Maldives. The capital is Kavaratti. The temperatures are stable throughout the year, however, before the rainy season, from March to May, the hottest time of the year occurs. Here are the average temperatures in Minicoy. The rainfall amounts to 1,500/2,000 mm (60/80 in) per year; the rains begin in May, a little earlier in Minicoy, which is located in the south; the wettest months, when the rains take on monsoon-like characteristics, especially in the north, are June and July. The rains decrease in November, and in December they are already quite rare. Here is the average precipitation. The amount of sunshine in Lakshadweep is quite good in the dry period, from December to April; from May to November, in the rainy period, the sunshine hours decrease a little. The islands lie in the path of tropical cyclones; they are formed more easily between April and December, with two peaks at the beginning and at the end of the period (April-June and October-December). However, given the warm sea, they can in theory form all year round. The sea in the Lakshadweep is warm enough to swim in all year round, as can be seen in the following table. The best time for a beach holiday in Lakshadweep is from January to March, in fact it is the least rainy of the year, and outside the cyclone period. In March, it can be hot, so the best months are January and February. In April, the rains have not started yet, but it is hot, and cyclones can already pass. All year round, light clothes of natural fibers, a sun hat, a scarf for the breeze, a light sweatshirt for the evening; in the rainy season, a light raincoat or umbrella.